Most hunting experts would agree that most hunters’ successes are closely linked to the ability to stay comfortable in a treestand for long periods of time. It’s true; Hunters must sometimes log some long hours in a treestand to outwit a wily game animal. The new Viper SDC represents Summit’s best, all-around climber with a perfect balance of features guaranteed to please the most discriminating hunter. The Viper SDC is roomy, allowing you freedom of movement when you need to pivot to make a shot. The Viper SDC is also a lightweight stand, with an amazing padded seat sure to keep you comfortable during long hours in the stand. In fact, this versatile padded seat can be raised for bow hunting and lowered for hunting with a muzzleloader or gun. The solid front bar on the climber makes climbing a breeze, and also works well as a gun rest. This Viper SDC also features our trademarked QuickDraw cable retention spring that ensures the cable remains in the preferred slot during climbing. Our unique RapidClimb Stirrups allow you to quickly slip your feet in them for climbing, and then conveniently slide out of the way when not in use. Thanks to our Summitlokt technology, the Viper SDC will still maintain its structural integrity even if a weld were to break. This is accomplished with our perimeter bar and tubing that is engineered to “pinch” together for safety. With our trademarked Dead Metal Sound Deadening Technology our stands are lighter and stronger, but yet feature less resonance and vibration than other stands. You’ll have to not hear them to believe them. The Viper SDC weighs in at a mere 20 pounds, yet supports 300 pounds safely. 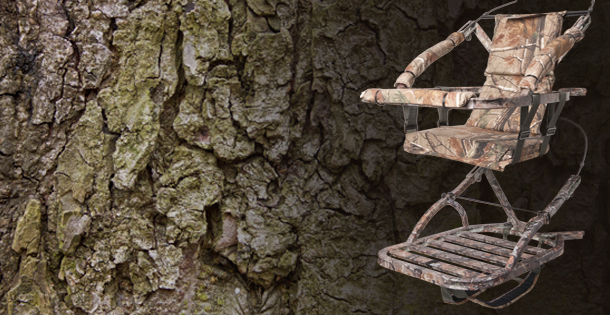 The Viper SDC features a Realtree AP camouflaged seat and platform. The stand also comes complete with a 4 Point Harness, padded camouflage back straps, umbilical rope, and a safety DVD. You can’t find a stand this good just anywhere. The Viper SDC is only available online. For more information visit Summit at www.summitstands.com.